Some old friends from college wanted to do lunch in SF and I recommended Pizzeria Delfina for some good Italian-style pizzas. 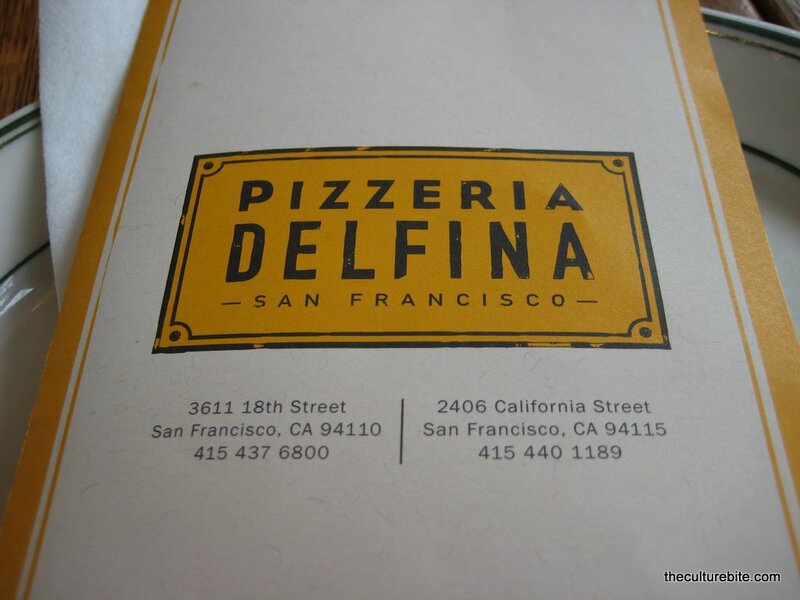 I’ve long been a fan of Tony’s Pizza Napoletana, so I was curious to know if Pizzeria Delfina was comparable. This casual but high brow restaurant attracts foodies all over the Bay Area that are looking for traditional thin crust pizzas with fresh ingredients and a glass of wine. I had no idea Pizzeria Delfina was so small! There are about 8 seats at the bar and 6 tables in the restaurant with 2 tables out front. We waited an hour before we were seated, but it built up our anticipation and hunger in preparation for our meal. It’s totally worth the wait, so don’t be discouraged with the large crowd waiting outside. Just walk right in, place your name in the waitlist chalkboard and patiently wait your turn for a table. For 5 people, the total bill came to $90 with tax and tip, 4 pizzas and no wine. The pizzas only took about 20 minutes to come out, but we were able to snack on some yummy breadsticks while we waited. Pizza Margherita – Although not as great at Tony’s, the pizza was very good. The mozerella was very fresh and the sauce was flavorful. The pizza could’ve used a little less crust on the edges and a little more pizza with the sauce and cheese. Panna – By far my favorite pizza during the meal. This pizza is topped with tomato sauce, cream, basil and shaved parmigiano. It was rich, nutty and strong in tomato flavor. I’d come back again just for this pizza. Clam Pie – As the most expensive of the bunch costing $17, I didn’t find this pizza to be that mind blowing. The pizza is topped with Cherrystones (baby clams), tomato, oregano, pecorino and hot peppers. It had a good kick from the chili flakes, but it was a little too salty for me. Salsiccia – This one was topped with housemade fennel sausage, tomato, bell peppers, onions and mozzarella. It was a basic New York-style sausage pizza. Very good, but not anything I’ve never had before. I found the pizzas to have too much dough on the outer crust. Because of my lock jaw, it became painful to eat towards the end of the meal. I’d love to come back and try their Prosciutto Pie. The meal as a whole was delicious though. I was surely satisfied, but I think Tony’s Pizza Napoletana is the winner because of their creative take on pizza. Oh noes! Bi-Rite is closing!